Preseason games don’t really matter to anyone, unless they mean that Dwight Howard made his debut for the Los Angeles Lakers, and then what is pretty much an NBA exhibition game becomes something worth mentioning. So how did the best center in the NBA, who hasn’t played basketball since early April due to a back injury that kept him out of the playoffs with the Orlando Magic and a big chucnk of the preseason for the Lakers? Not bad at all, unlike the end result for his team. Howard spent a total of 33 minutes on the floor, finishing with 8-12 from the field, grabbing 12 rebounds, getting 4 blocks and scoring 19 points. The Lakers actually played their starters, all five of them, over 32 minutes each. During their time on the court, the Lakers were in the lead, but eventually lost their sixth consecutive preseason game. Does anyone care? Probably not, because Howard looks healthy and ready to take over for whatever legacy Andrew Bynum left behind him. Main man? Still Kobe Bryant. Not even a question. Bryant seems more of the ball than anyone else, especially if Steve Nash is actually hurt from what appeared to be a turned ankle. This is his team, and Howard is a great option in the paint, complementing Pau Gasol who works around whatever is given to him, but eventually, everyone are just Bryant assistants, for the time being. But some see more equality in the offense. When there’s nothing on the line, Bryant passes more, and allows people to reach his field goal attempts numbers. Bryant had this to say about the new offense: With the offense that we have, on top of the talent we have, it opens up the floor a lot. For me, I’ll get two backdoors a game, for layups at the rim. There’s more spacing in the middle. There’s quick post-ups. You won’t see me holding the ball too often unless I’m in the post. Is that a promise? Probably not. The real test won’t be just regular season games, but close games, in which Bryant is used to disregarding everyone else on his team and try and win by himself. Howard was clearly rusty, turning the ball over five times, but he was pleased with his over performance: I think I was very active on both ends of the floor. Other than that, I was a little rusty. 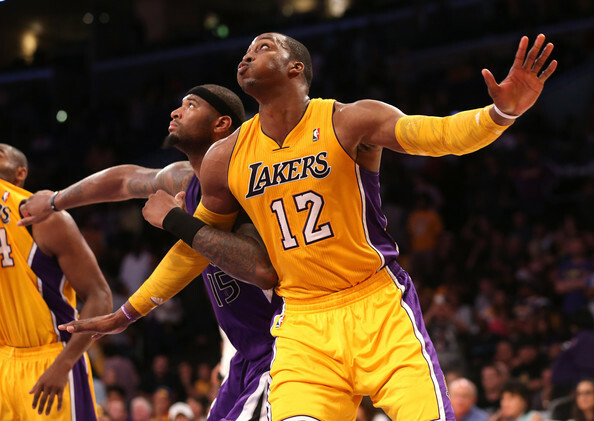 The real addition of Dwight Howard arrivin to LA is his defensive ability. He might not win the DPOY award each time, but there’s no one in the NBA who blocks as well as he does and that changes so much of the opponents’ offense as well as he does. Andrew Bynum is just as talented offensively as Howard, maybe even more. Sure, Howard is a better rebounder and more athletic, but the big advantage by having Howard is what it does on defense, which is something Mike Brown knows quite well. A double-double? That’s nice, but pretty much meaningless besides seeign that Howard has made some nice progress this summer with his back, probably getting some extra motivation by playing for the Lakers to get well sooner. Recoveries in Florida for underachieving teams usually take longer.